On a ski or snowboard outing in the Green Mountain State, the right gear can make the difference between lapping one sublime run after another, and making a beeline straight back to the base lodge. Choosing the perfect pair of skis or snowboard and the right apparel for the conditions can be daunting – luckily, Vermont resorts can provide expert help. From the knowledgeable staff in the rental shops to the customer service pros on the retail side, the state’s ski areas are more than capable of getting you outfitted from head to toe in preparation for your on-mountain adventure. As technology advances, so does the gear – and Vermont’s perpetually revamped rental and demo fleets and shop inventories reflect that. Bromley: The Bromley Rental Shop offers the latest in skis, snowboards, helmets, and even tele gear. The rental fleet is fully equipped with Burton LTR snowboards, standard HEAD BYS Skis, and high end Rossignol Experience 80 Skis. All designed with comfort, performance and time efficiency in mind. Plus, the Potter Brothers Ski & Snowboard Shop, located in the Base lodge, will be upgrading its demo fleet for the 2018-19 season with the addition of 2 new ski brands, HEAD and Stockli. Both brands offer a strong collection of front-side carving skis that are ideal for ripping turns on Bromley’s groomed terrain. These brands team up with Volkl, Rossignol, Atomic and Blizzard to complete a very impressive demo ski collection in the shop. Need a quick tune up? The Bromley Rental Shop’s highly trained repair staff can get your skis or board back in shape, and ready for the slopes! 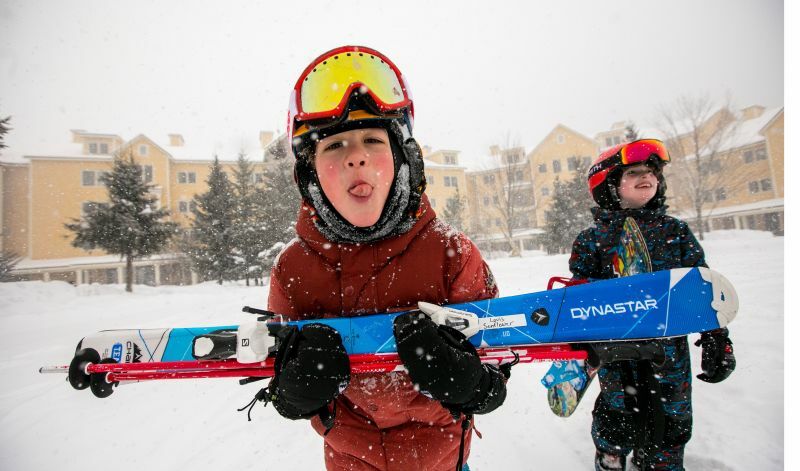 Stratton: First Run in Stratton Village is the perfect place to try before you buy with leading brands including Rossingol, K2, Armada and Head. The First Run Demo Card is available for $75 and includes three days to test an unlimited number of skis plus a $120 credit toward purchase. Stratton is also home to one of three East Coast Burton Test Ride Centers. In addition to standard and performance gear, the Rossignol Experience Center offers the latest in premier ski models. All rentals include helmets, free overnight storage and the opportunity to switch gear throughout the day, even from skis to snowboard. Trapp Family Lodge: The Trapp Family Lodge Outdoor Center is constantly adding the latest gear and fashion to the offerings. This year, the Outdoor Center will be switching the rental fleet to the NNN binding system. Utilizing the ‘Prolink’ binding has been helpful with compatibility for Salomon boots. Okemo: Two convenient retail locations serve Okemo guests with all the gear they need for a ski vacation. Whether it’s disposable hand warmers, a replacement for a misplaced neck gaiter or pair of goggles, or a new pair of skis, Okemo has it all. Okemo’s Snowsports Shop is located in the Clock Tower base lodge at the resort’s original base area, and Mountain Outfitters is under the stone archway at Jackson Gore. New for the 2018-19 season, skiers will see Blizzard/Technica added to the mix. Okemo has also expanded its boot-fitting operations to include custom foot beds by Sidas. And, Okemo is the largest Patagonia dealer in the Ludlow area. Magic: Magic is expanding its retail shop due to high demand for Magic gear and with that increased space will come more fun gear for the whole family. Be sure to visit us in our new home next to Ski School! Mount Snow: With the opening of our new $22 million Carinthia Base Lodge, Mount Snow is pleased to announce the opening of Mount Snow Sports at Carinthia. Mount Snow Sports at Carinthia offers everything you need to get out on the slopes from the latest skis and boards from Line and Burton, to outwear, accessories, and more. Sugarbush: This year the Adventure Gear Shops, in addition to its annual restock of new gear, will boast a collection of 60th anniversary apparel and memorabilia including hats, shirts, outerwear, stuffed animals, and more. Smugglers’ Notch: Smugglers’ 3 Mountain Equipment recently installed a brand new, state-of-the-art Wintersteiger tuning machine in preparation for the 2018-19 season. This fancy new wonder rig is able to put a custom tune on any type of equipment, of any shape or size. This includes the wide variety of profile shapes and styles popular today. Everyone from racers to backcountry enthusiasts will be pleased with the range of customizable settings this machine offers, from edge bevels down to ¼ degree, to structured base patterns. For more visit https://www.smuggs.com.